I like making little gifts for my relatives and friends children and now that I have my own daughter I have another person for making things for. Sliding dovetails have always fascinated me so this was a perfect opportunity to let rip with the router table. 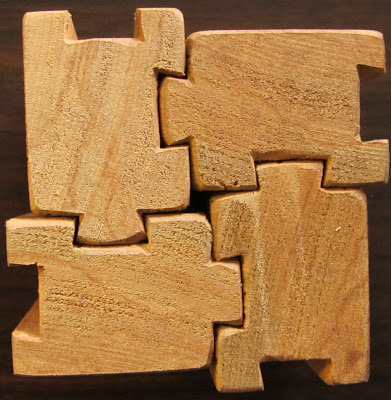 Prepare some lengths of timber planed to the same dimensions, whatever you have to hand is probably suitable provided it is not treated. To cut the groove, first rough it out with a straight cutter of suitable width to save work on the dovetail bit. Similarly, for the pin, make a light cut part way before the final cut. Cut the prepared profile to lengths. The most time consuming part of the operation is the sanding of all those edges! If you know of a quick way to do it let me know. 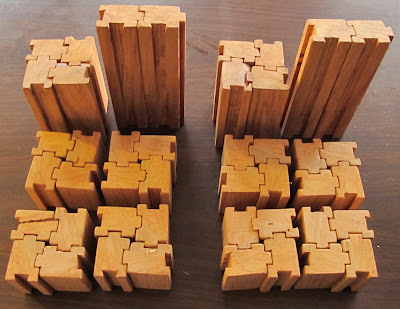 If you use a pale coloured wood you could dye the blocks with food colouring. What you build from them is up to your imagination. It finally came to that time in life to have a child so my thoughts briefly turned from adventures like caving and climbing to things like "how to transport the offspring in a two-wheeled pedal-powered fashion?" I dislike trailers for child transport because the child is behind you and out of sight where cars can pounce with no warning. Child carriers perched on the bike seem a bit vulnerable if the bike falls over. The solution? 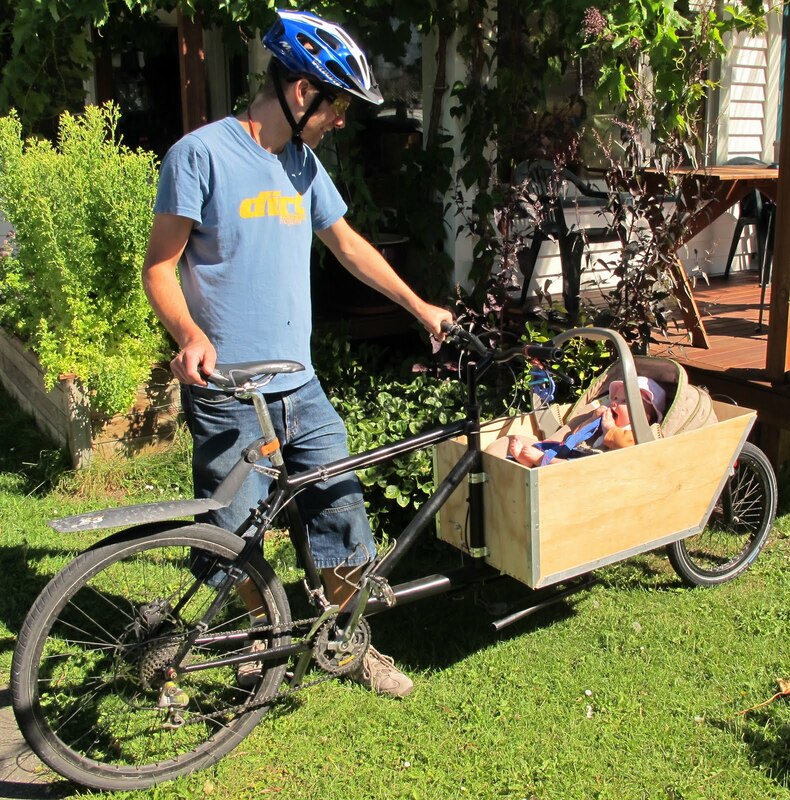 A two-wheeled bakfiets cargo bike as used by thousands of mums and dads in Denmark, Holland and increasingly Seattle. The commercial models aren't readily available in New Zealand and they are rather pricey, although still cheap compared to a car. 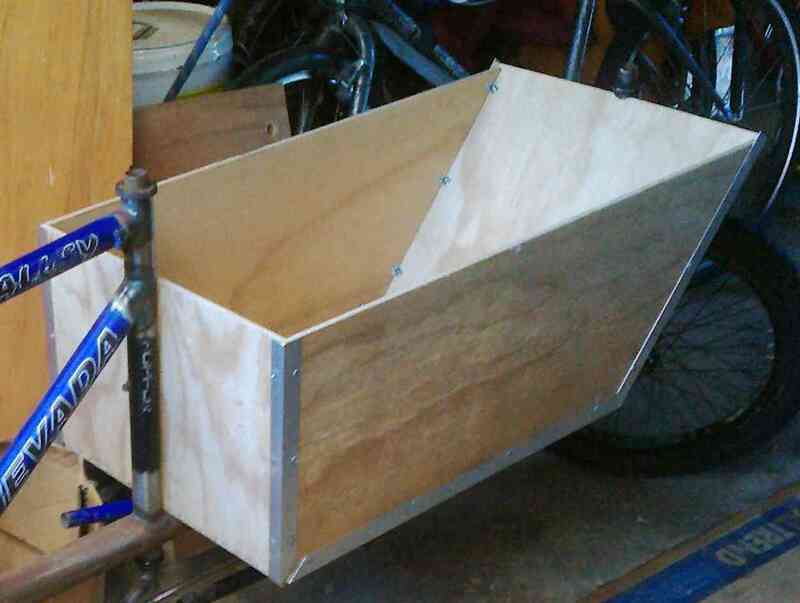 If other people can hack one together from chopped up bikes, then why not me? I'm not much of a welder but luckily I have a friend, Bevan, who has a TIG plant and is a dab hand at welding bike tubes, having built himself a tandem bike amongst other projects. I drew up a quick plan and procured the necessary donor bikes. In the end the rear bike was given to me by the same friend who did the welding. I wanted to put a disc brake on the back so a vertical dropout frame was preferable. 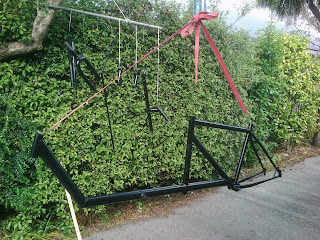 The frames I had were all the older style sloping dropout so the donated frame was more suitable. I decided to go with a 26" wheel mountain bike for the rear because most of the bikes in my stable are mountain bikes and I figured a triple chain ring could come in handy when hauling a big load. For the front I bought a trashed old kid's BMX which came with an extra beefy front wheel which I was glad of. The front fork off the BMX was set up for a caliper brake so I shaped up some cantilever bosses (cut from another old fork) to weld onto it. For the steering arm that the steering strut attaches to I used the bottom of a fork arm with the dropout cut off. I left the conveniently M6 threaded fender mount to bolt the ball joint to. To shape the tubes accurately for joining, I used one of the many tube notching programs available on the web. I cut the tubes with a hacksaw and then did the shaping with a half-round file. I bought a good file for the job which made it much faster. I was planning on getting a piece of rectangular hollow section steel for the main tube but my friend came through again (remind me to buy him some beers!) with a length of 2" mild steel exhaust tubing. 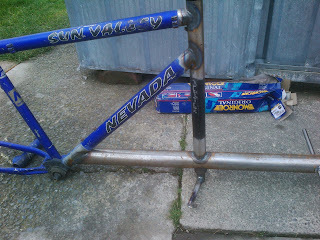 The main tube is ovalised at the front and welded to the head tube cut off the BMX. The main tube is pierced by the rear head tube which is formed from the top tube of another cannibalised bike. The back of the main tube is ovalised and welded to the donor frame just in front of the bottom bracket. A beefy kick stand was formed by cutting and welding two old steel handlebars into an H shape. The top of the H mounts into two cut down quill stems. The quill stem brackets mount onto a small diameter tube that pierces the main tube. They run on a polythene bush made from irrigation pipe. 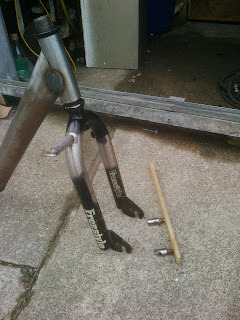 The rear steerer tube was fabricated by cutting the steerer tube off a donor fork and extending it with some extra tube of a similar diameter. 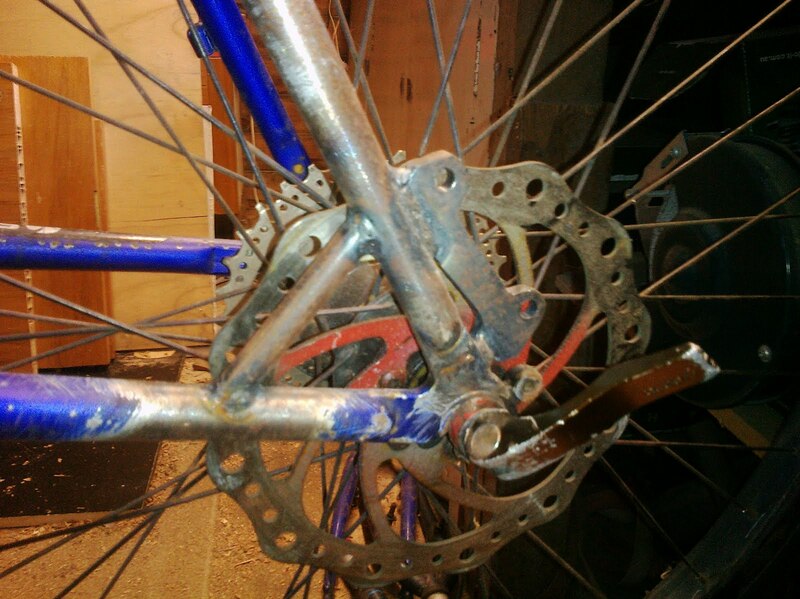 The steering arm was again made from the reused end of a donor fork. The steering strut that joins the rear steerer tube to the front fork was cut and welded rather than bent because it was easier to do and it also matches the sharp angle of the front of the box better. Getting the positioning of the steering system correct was quite important to allow sufficient turning angle. I didn't get it quite right so that on full left the steering strut rubs on the back of the front tire. Not a big deal really as the full lock is never reached while actually riding. The steering strut has M6 nuts welded into the ends to mount the M6 threaded ball rod ends. I left the rod ends loose in the steering strut so the strut is free to pivot out of the way of the front tire when it hits. The only other modification was to weld a disc brake mount to the rear of the main donor frame and a small reinforcing brace next to the mount. To house the cargo I built a plywood box. The bottom and ends of the box are 9mm ply box-jointed together. The box joints were just cut by eye on the cross cut fence of my table saw, as a high precision fit was not required because the plywood is soft pine. Cutting the angled box joint was tricky but I rigged up a tilting fence which did the job. The 7mm sides of the box are joined to the bottom using aluminium angle connected with M5 countersunk screws into T nuts. The box is mounted to the frame using steel saddle clamps and M6 screws into T nuts. 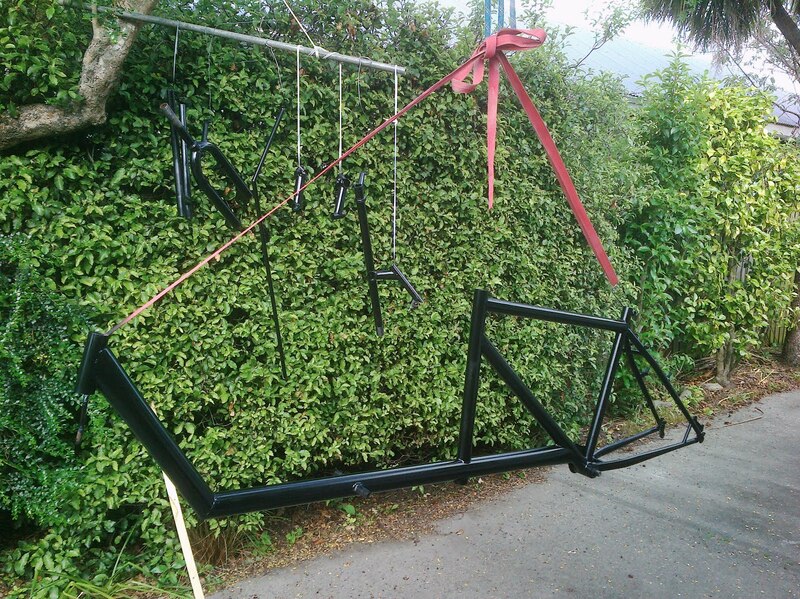 After about six months of intermittent work on the cargo bike and the delivery of a new daughter to use as cargo, I was finally ready to give the whole lot (not the new daughter though) a couple of coats of gloss black enamel paint from a can. A free ride to anyone who can correctly identify all the parts in this photo. I weighed the bike and it comes in at a very respectable 25kg with the box. Compare with the commercial models which run high thirties. 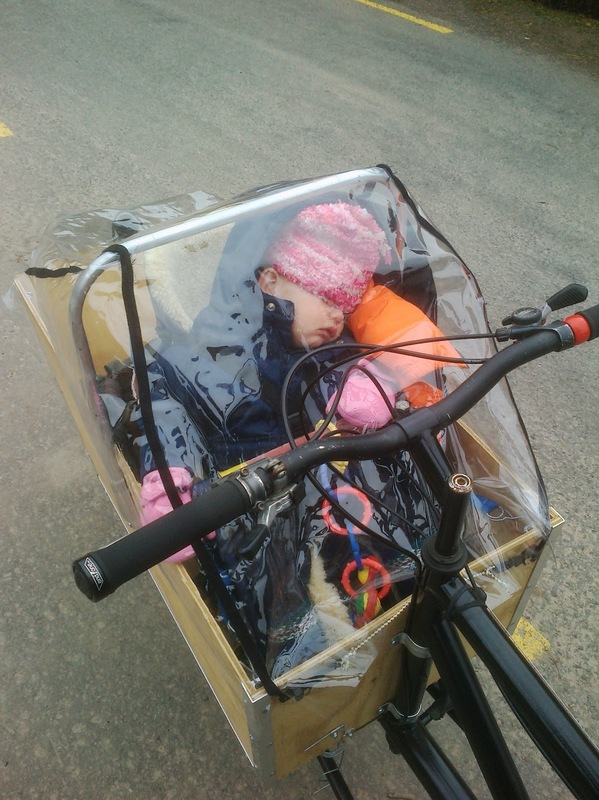 I added a removable aluminium bar to support a weather cover. It seems to work (see photo below). 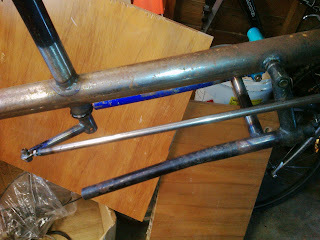 The steering bar has turned out to not be quite stiff enough. It is fine during normal riding but flexes when the wheel is pushed on hard. I'll upgrade it to 12mm or larger at some point. 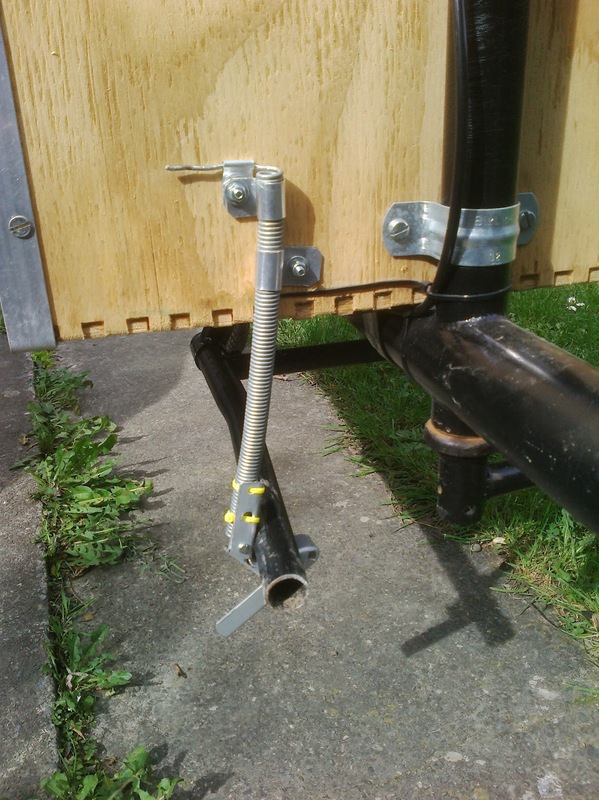 The stand retaining clip was a bit light weight and I had a couple of complaints about it so I remodelled it using a spring.